Over the summer, I had the great pleasure of hosting Jimmy Casas at my house for a few days to try to show him a great time fishing on the Kenai. I had it all planned out with venturing out on the river with a local guide, hiking the Russian River from the falls to the trail head and heading out on the lake I live on to catch a few rainbows. It was in my eyes the perfect plan for two and a half days and a quick turnaround. What actually happened is not exactly what I had thought. We ended up with hooks in the leg, long fishing hours with little fish to show for it, a grilling inferno, falling in the river and to top it off a dead motor halfway across the lake with no paddle. We ended up making our way to an island on the lake and finding an old plastic snow shovel to paddle our 19’ Lund back to the shore in front of my house. It was a good thing we budgeted our time wisely enough for them to still make their flight. Even though we had all of these mishaps, we were lucky enough to have Jimmy’s son, Alexio, along for the ride. Not only did he take his fair share of turns paddling with the snow shovel, being the youngest one, he also had the most insightful reflection on the entire experience. He said something to the effect of, “You know I’m glad things didn’t go perfectly during this trip. That’s what made it feel real and authentic.” He truly had a genuine appreciation of the entire adventure and it made me feel like the trip was not the disaster I was afraid it had become. Is that not what we want for the students in our schools – to genuinely appreciate the adventure of learning through authentic experiences? We know when we have reached that point with students because just like Alexio, we hear it in their voices and see it with the expressions on their faces. It is those times where their curiosity and creativity are fostered and nurtured. How do we ensure our students are receiving these authentic experiences? I know that we are pursuing a multitude of options with all levels at Nikiski Middle/High. We continue to modify and refine our processes for our student led Ed Camps and are bringing in some makerspaces in the form of a Lego wall and design challenges with Keva wood planks. We are piloting ways for our older students to develop an independent study curriculum to earn academic credits while participating in internships, apprenticeships, and on the job training so they do not need to juggle their time still taking a traditional class. We even had our staff participate in a wellness Ed Camp to share how they keep themselves sane through a long, dark winter. The next step is to have a staff makerspace…I am just not sure what that looks like yet, but I would love to hear some ideas. One thing I know from all of this is that I needed another perspective to show me what was successful and that these authentic experiences happened organically while we were together exploring what Alaska has to offer. We need to draw on each other and work to collaborate on our ideas so that all of our students gain from those authentic experiences. When we talk about transformative leadership and how that applies to what we do within our school, innovative practices are where we look. I had the honor of being selected to work on the commissioner’s AK Education Challenge over the course of the past year and the comment that stuck with me throughout my time was the focus on “transformative ideas.” These are ideas that have the potential to transform how we run our schools, districts and entire statewide educational systems into the future. We saw pictures and ideas from past task forces and committees that have simply been revisited throughout the years, just re-packaged with many of the same unconvincing results. Fast forward to this year and I find myself asking the same questions on what we can do to transform practices in what I can control the most – my own school. Since the Ed Camp model has already been very successful at our district administrator meetings and then again at my school level with staff Ed Camps, we figured the next logical step would be to move forward with Student led Ed Camps. Student led Ed Camps makes learning student-centered and provides students with an opportunity to determine what, why and how they learn. These characteristics are the fundamental building blocks of our district’s and state’s emphasis on personalized learning. One caveat to mention here is that this was not the most comfortable direction to be heading. We essentially turned over all the power of a school day, early release mind you, to the students to do with as they please. The staff did not dictate the direction and it was basically students teaching students something they were interested in or learning about it together. It is the same way our district leadership felt when the agenda of the admin meeting was determined by the school administrators or how I felt when I turned over the direction of professional development days to my staff. Bottom line for my school is that we ingrained Ed Camps into the culture of our school and felt the culture should permeate through to our students as well. We prepared ourselves for this next step with students by actually experiencing it ourselves. I truly believe that without this preliminary work with the entire staff, the buy in and ownership of Ed Camps would not have been as strong and possibly could have been a failure without the understanding of what an Ed Camp is and the experience of working through multiple staff led Ed Camps. We have now gone through a total of three different Student led Ed Camps over the course of the end of last year and into this year. There has been a couple of different formats and we continue to debrief as a staff to determine what was successful, what was a challenge and what can be changed for next time. Currently, we have plans in place for three more Student led Ed Camps this school year. Every time we schedule one or one is looming on the horizon, I continue to be nervous about it because I have very limited control over what happens. Then I realize we are truly growing as a school because my entire staff has embraced the Ed Camp philosophy and chooses to reside outside of their comfort zones. Which I hope will make them continue to be risk takers and innovators to do our very best for our kids. To me a hero represents someone who emulates a life, skills or some other trait that we desire to be like or possess. Often times we will read books, watch a video or attend a conference that may give us a path towards becoming more like that person. Many times we come to find out that the more we try to mimic someone else, the more we fail. At times, we forget how much our heroes fail before they finally figure it out. Is Michael Jordan your hero? He missed approximately 9000 shots. What about Babe Ruth? He struck out nearly twice as many times as he hit a home run. Pandora was rejected by around 300 venture capitalists before finally landing a deal. Chemists failed 39 times before finally producing the wonder lubricant WD40. What would’ve happened if Elizabeth Blackwell, the first female in the US to earn a medical degree, quit trying to get into medical school after her 29th attempt? (She got in on number 30). We all have heroes in our lives whether they are professional, personal or in the things we enjoy doing. Growing up I always loved baseball and my hero was Dale Murphy from the Atlanta Braves, yes, even in Alaska, Ted Turner inundated us with “America’s Team” and made Braves fans across the country. I remember one specific time when a teammate and myself were arguing over who was going to be Dale Murphy in our soon to happen whiffle ball home run derby. Throughout our discussion we each came up with our perfect and sophisticated argument for being Dale Murphy, “You can’t hit the ball far enough” and “I can hit the ball farther than you.” Our “discussion” must’ve gotten a little heated because a third guy came over and simply said, “Oh yeah, well I’m going to be Timmy Ferris.” His name was Timmy Ferris. Fast forward life now for about thirty years and I find myself having heroes in my professional life. I see Jimmy Casas motivate and inspire teachers and principals to be the best they can possibly be. Glenn Robbins with his risk taking in the Ed Camp and Maker Space worlds. Ben Gilpin on building relationships and how he opens himself up to the people he leads by being vulnerable. It’s like wrapping up Superman, Batman and The Flash in one ultimate educational superhero and being that person; I want to be that person! Then as you talk with your heroes a little more, you realize the struggle, challenges and failures they all went through to get where they are, it’s their story. They just simply never stopped trying as they pursued their passion. They were persistent and acted fearlessly. Bottom line is that it is awesome to have heroes. They inspire and motivate us to become better each and every day. These three gentlemen who I was able to connect with are those inspirations for me and I know they have their own journey, just like I have mine. I can’t hit the “easy button” and all of a sudden become the ultimate education super hero. I have to remember Timmy Ferris and be my best self. Who knows, maybe even I will become someone’s hero someday. What you may not know is that she may only be a sophomore, but she is a very good basketball player, one who much of the team already looks up to because of her skill and court leadership no matter their age. Because I see her as a leader, I shared a story from my days as a high school student. When I was a freshman in high school on the wrestling team, an older student from the team pulled me aside after the last tournament of the year. This guy was a two-time, undefeated state champion who I admired a great deal. He said to me: “Wow, you are such a good wrestler! You have an awesome work ethic and the coaches love what you do. If you keep doing what you’re doing, you will be way better than I ever was.” After almost 30 years, those words are still with me and propelled me to a very successful high school, collegiate and coaching career. After I shared that story with my daughter, her eyes became a little wider as she understood the point I was trying to make. We talked about how she could step out of her comfort zone of just court leadership and translate that to peer leadership on and off the court. She is starting to take those steps, sometimes slowly, of being the leader and encourager of her peers…no matter her age. I don’t share this story because it’s a feel good story about my daughter and I; I share it because we have so many potential, young leaders walking through our hallways. The question is now: how do we as leaders encourage our younger generation to step out of their comfort zones and lead their peers? Sometimes it takes a word of encouragement, sometimes it takes a modeled behavior, sometimes it takes a story relating to one of their own experiences. Whatever it takes is what we need to give as it is our duty to cultivate the leaders of tomorrow. Let’s all take the time to seek out those leaders of tomorrow, develop them and build those positive relationships. You never know, that person you develop could be the next coach, CEO, or even president. We can facilitate the beginning of their journey. 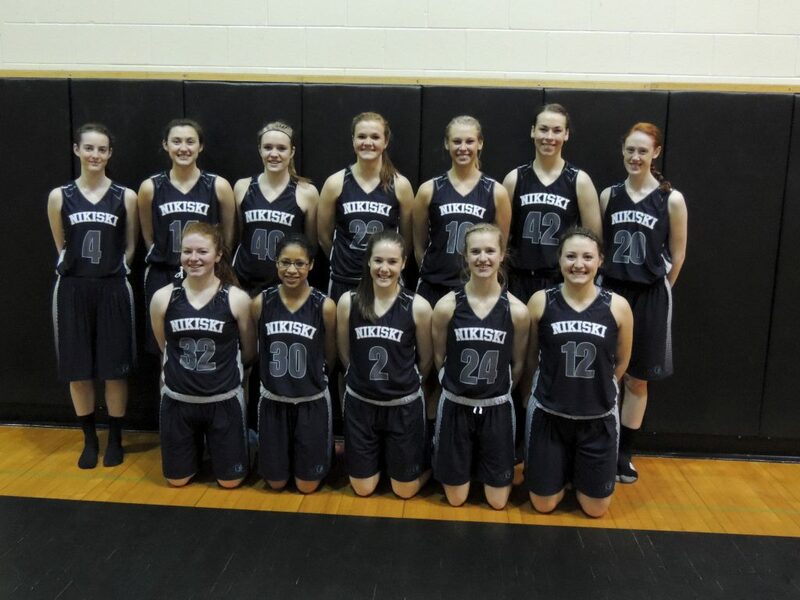 The Nikiski Girls Basketball Team traveled to the State Basketball Tournament at the Sullivan Arena March 20 – March 22. Alyssa Darch earned a place on the 3A State Championship All -Tournament Team. Only 10 players from the 8 teams represented at State were chosen. Alyssa scored 15 points and pulled down 17 rebounds in Friday’s game against Valdez.